This weekend a host of brewers and musicians gather at the formerly closed off marine territory in central Amsterdam. A number of the world’s best known craft brewers, Anchor, BrewDog and Weihenstephan, participate at The Amsterdam Beerfair, as do some of Amsterdams finest. But there are a number of participants that are less well known in the Dutch capital. One of them is De Dochter van de Korenaar, a great brewery whose beers are not as widely available as those of their aforementioned colleagues. If you did not know them yet, we think you should take the opportunity to change that at the Amsterdam Beerfair. De Dochter van de Korenaar has managed to capture the heart of beer lovers in less than ten years with an original vision and a crafty approach. Unlike many of the current craft brewers, founder Ronald Mengerink did not join the revolution recently. He has been brewing since pre-Youtube-tutorial times and only decided to find an outlet for his two decade brewing experience in 2007. The brewery is located in the municipality of Baarle-Hertog, a part of Belgium within the Netherlands. This geographical oddity might explain the successful combination of the Dutch drive for experiment and the high quality standards of Belgian brewers. No wonder the resulting beers often couple surprising taste to solid quality. 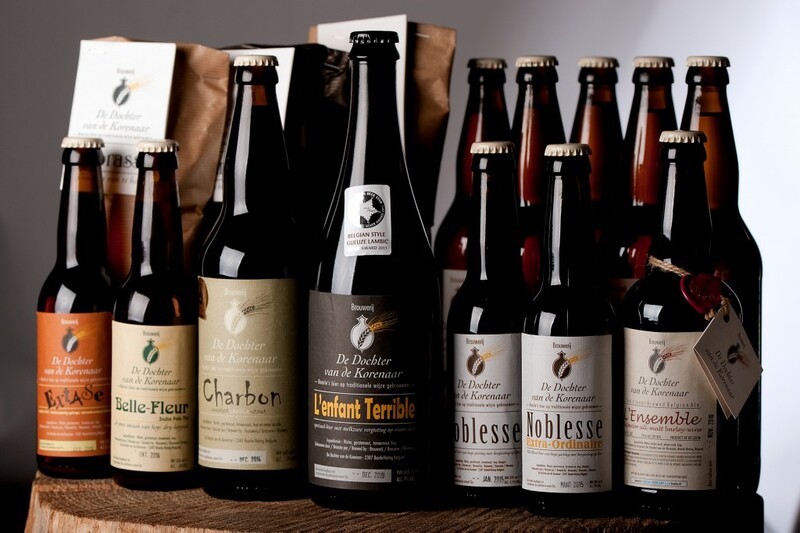 The labels of De Dochter van de Korenaar communicate the classy craftsmanship that has become the brewery’s trademark, while the French names they pick for their brews add elegant appeal too. Ronald Mengerink is an all-round brewer and as a result the selection he brings to Amsterdam this weekend displays a nice diversity in styles. There is a saison brewed with orange on his list, Beau Monde. So are the brewery’s two better known I.P.A.’s, Belle Fleur and Crime Passionel. When feeling a little adventurous, ask for the Charbon, a stout with vanilla and smoked malt. When feeling very adventurous, ask for l’Enfant Terrible, a funky, complex sour aged on wine barrels for over a year. Whether any of this this appeals to you or not, do not forget to come see us for a tasty beer at the fest too.